I had to do some welding today, so I haven’t been able to make progress on my saw chest. Hopefully after I do homework with my son I can sneak in an hour or two for some woodwork. Luckily it was cooler today, it was in the 90s yesterday. 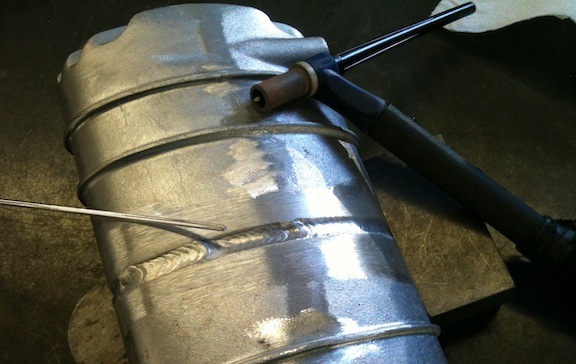 Welding on a 90+ degree day is my favorite thing not to do. I put on my ear buds and cranked up my favorite playlist and went to work. 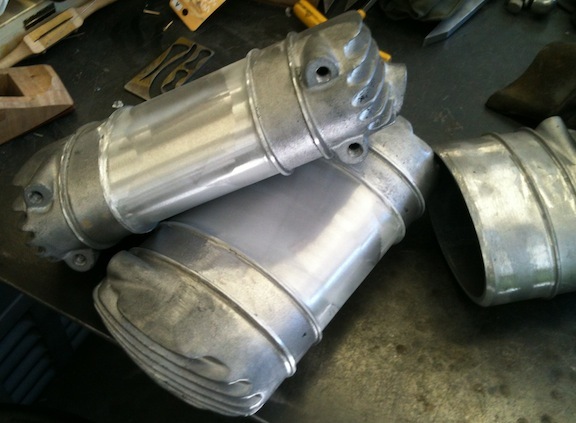 I have these tanks cast in aluminum, in halves. 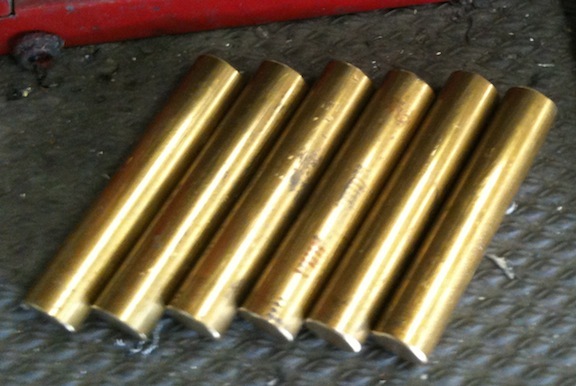 I TIG weld them with 1/8″ 4043 rod using a 1/8″ lanthanated electrode at 190 amps AC. I have a newer inverter style Miller welder, my old transformer based 300ABP had to run flat out at 300 amps to do the exact same weld. 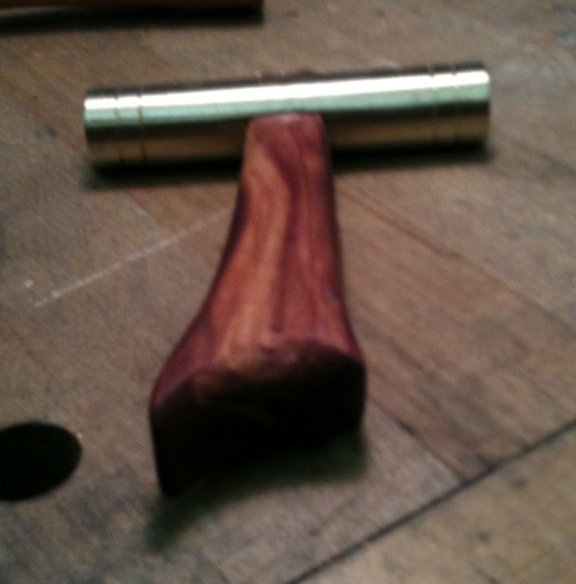 I do two passes, a root pass in a beveled joint, then a cover pass. 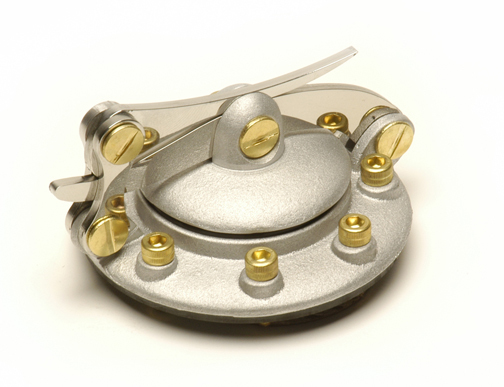 I go for penetration on the first pass and a nice flow out on the second pass. The part gets quite hot along the way. And I had Ray Wylie Hubbard cranked up. I welded up a bunch of headlight mounts while the tanks were cooling down, then I had to grind the weld and make it disappear. 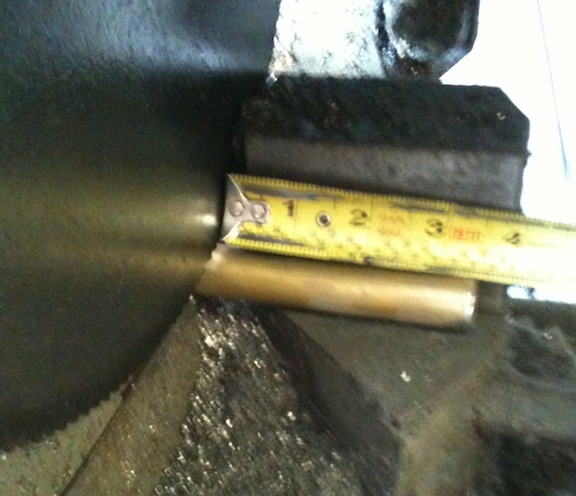 50 grit to flatten the weld bead, then A300, A160 and A65 3M Trizact Gatorback to get it to this point. 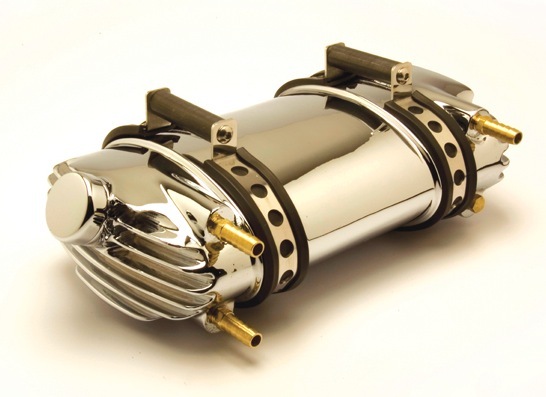 The rest of the tank is then worked up to the same point, and sent off to the chrome shop. This is what the finished product looks like. Now I need to get back to my saw chest. I’m constantly shuffling my planes, saws and chisels from the welding bench to the wobbly cabinet bench to make room. Once the chest is done at least the saws will have a home and stay clean. My blog buddy Marilyn sent me a link to a cool video that I want to share. As best I can tell, based on my rusty high school Spanish and attempting to read French, this is a film that was made in 1931 that shows students at several “professional” schools around France. 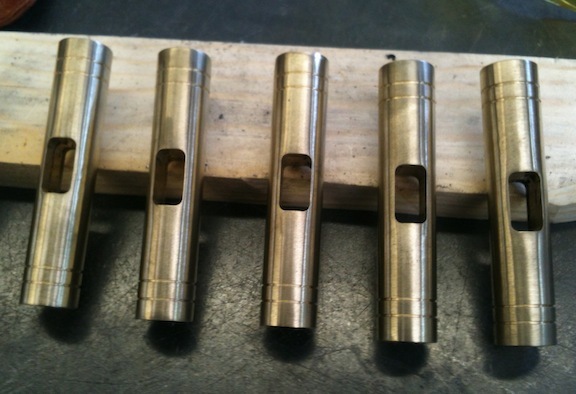 There is blacksmithing, machining, pattern work in preparation for casting parts, foundry work, drafting, electronics and radio, and of course carving and cabinet making. Actually I figured that out from the pictures, my high school Spanish doesn’t even cut it for ordering lunch at the local taqueria. There are also more berets than you can shake a stick at, and a general dearth of safety glasses. One of the things that caught me interest was the number of people working at once. 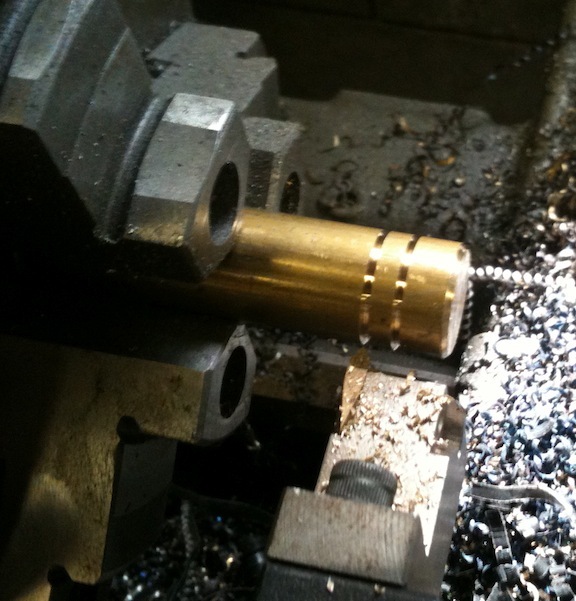 My experience is primarily working in my own shop. 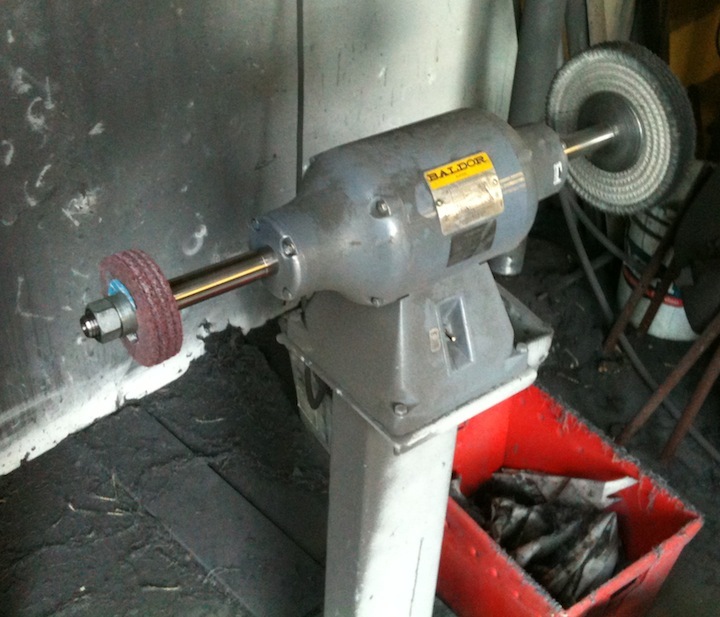 At one point I had five people come to my shop on Saturdays to grind, sand and polish chopper parts – but most of my experience is working alone in my shop. To see a dozen people vigorously planing, chiseling, sawing and hammering is pretty amazing. The slightly stiff, slightly sped-up-ness of the video helps too. My friend Ron wanted to know if wearing a beret would help my dovetails. Honestly, some days I’d be willing to try. I started making the top for my saw chest recently. It’s going to be a frame and panel construction with the stiles having tenons that fit into blind mortises in the rails. Or maybe through mortises, we’ll see. First the groove I cut with my plow plane was a little rough. I added a wood extension to the fence on the plane to help stabilize it, and reduced the depth of cut – that seemed to take care of most of the problem. The rest is just paying attention and keeping the cuts consistent. 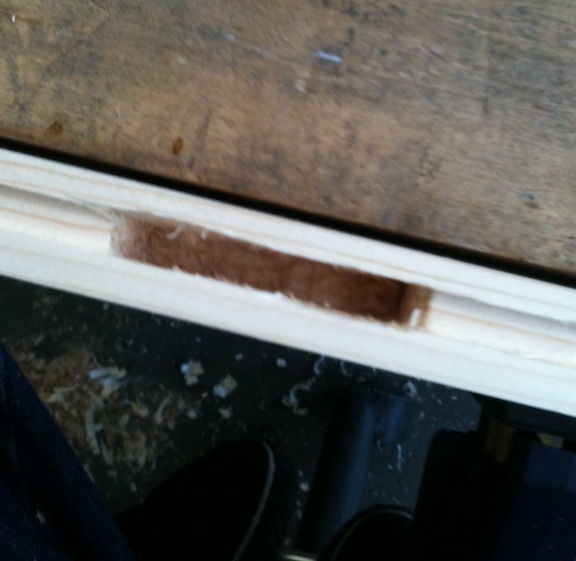 Second, the tenons weren’t snug enough I think. 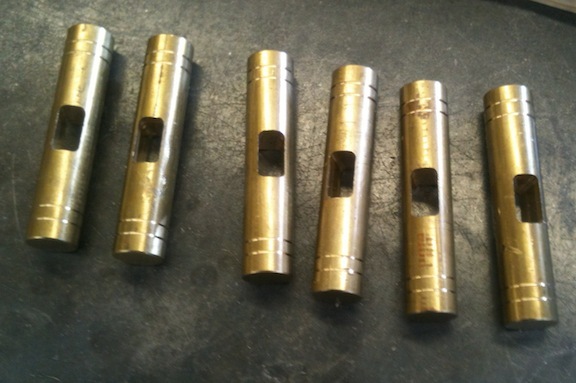 They weren’t loose, they didn’t wiggle around, and they fit right from the saw – but I think I want to be able to have the fit be a little tighter. Finally, the frame didn’t lay flat when it was dry assembled. 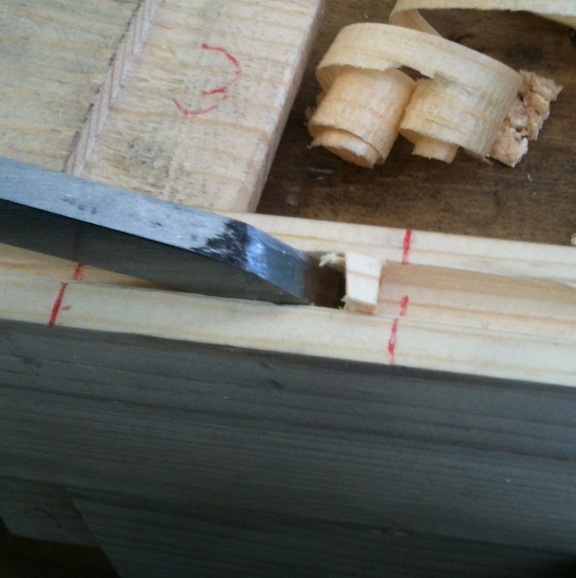 At first I thought it was one of the tenons, but it turned out to be one of the mortises was chopped slightly at an angle. If I assembled the frame with one corner not inserted into the mortise that stile would angle up in the air while the other three sides laid flat on the bench. Rats. So, three strikes and it was kindling (or as my son says “Epic Fail”). I decided to practice chopping mortises. The new “Make a Joint Stool from a Tree” book from Lost Art Press has some great information on chopping mortises. I tried to apply what I read to my practice. Now I need to go back and re-read it to make sure I didn’t miss the point. I started by working with the chisel at an angle, with the bevel almost vertical. 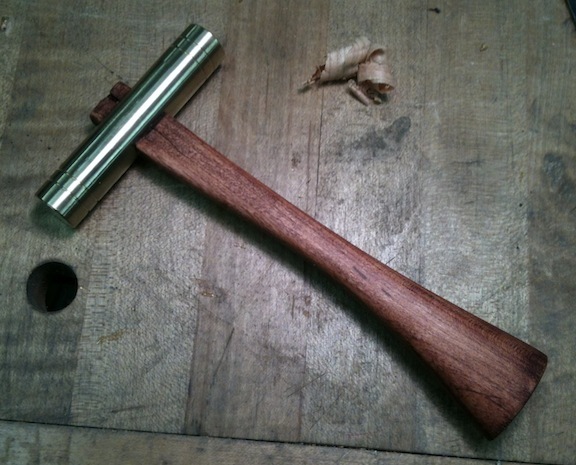 One or two whacks with the mallet – I’m not trying to reach the bottom of the mortise yet. 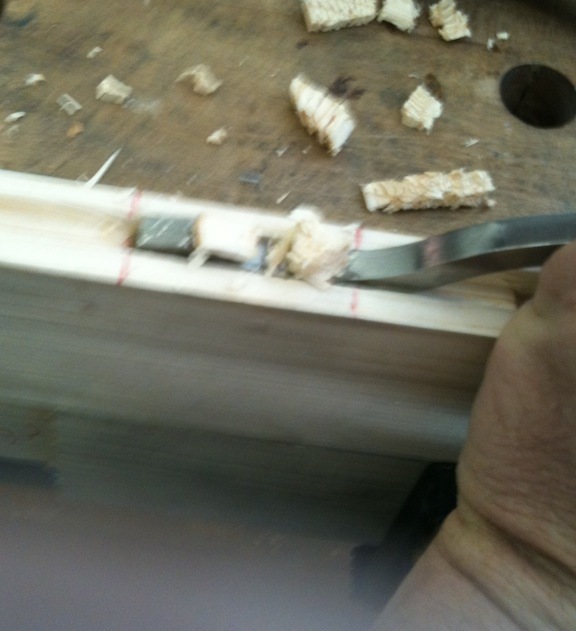 This practice part has the groove for the panel plowed, but that has nothing to do with the mortise itself. 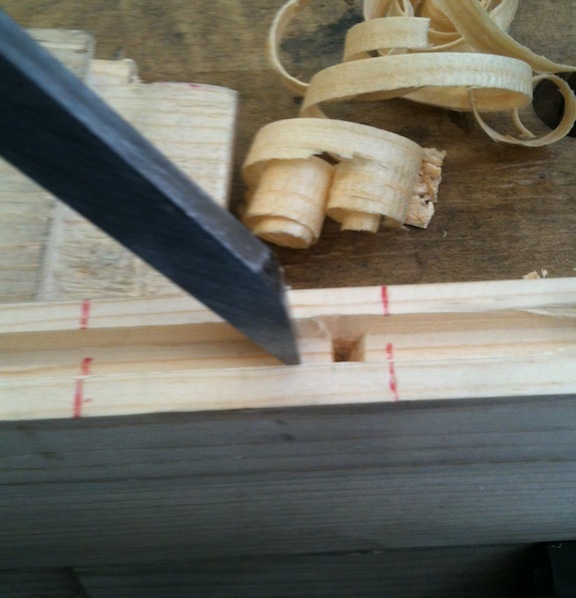 Then turn the chisel around so the bevel faces the other direction and make a cut to meet the first cut. If all goes well you should have a smal triangular chip just pop out. 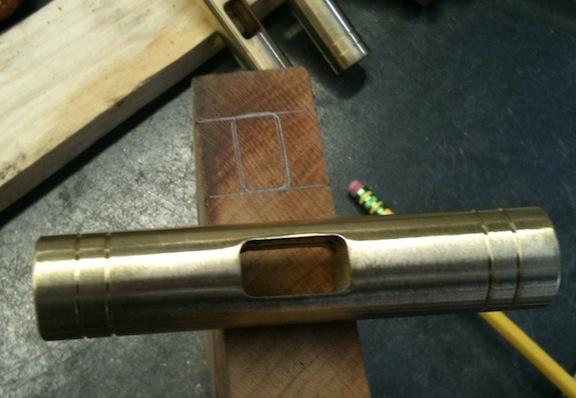 By the way, see that black “patina” on the tenon in the background? That is polishing residue. We’re going to make some shop setup changes to avoid that kind of mess in the future. Now continue working from the sides, at an angle, until you reach the bottom. Stay away from your layout lines until you are at full depth for the entire width except for an 1/8″ or so at the shoulder. 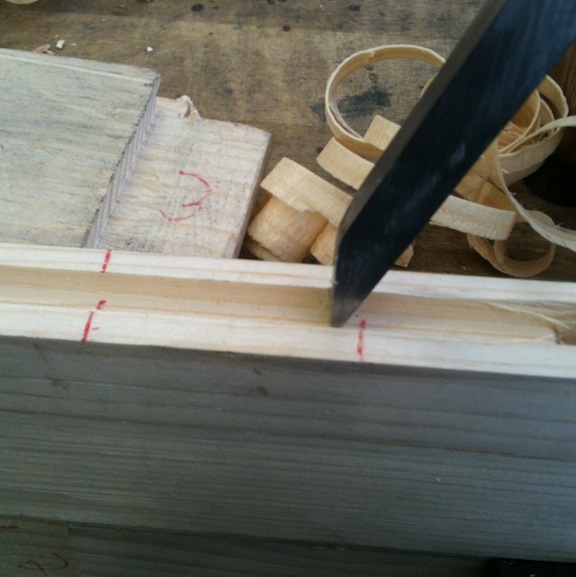 With each angled cut you can go a bit deeper and still pop the chip out without trouble. 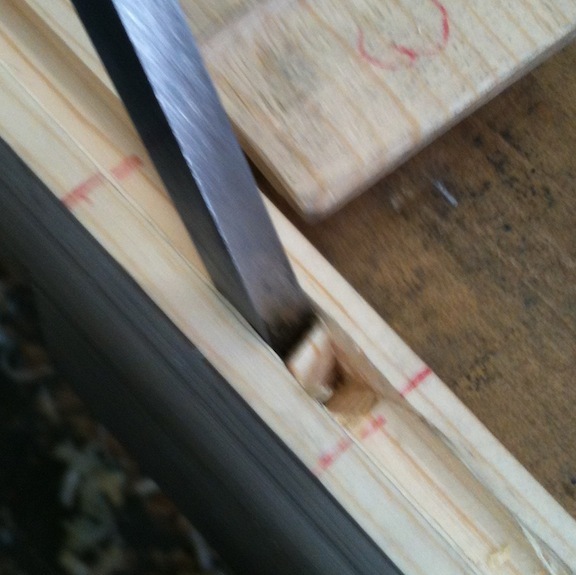 Make sure you’re holding the chisel plumb to the sides of the mortise – that was one of my mistakes. You should be able to accumulate a pile of chunky chips fairly quickly. 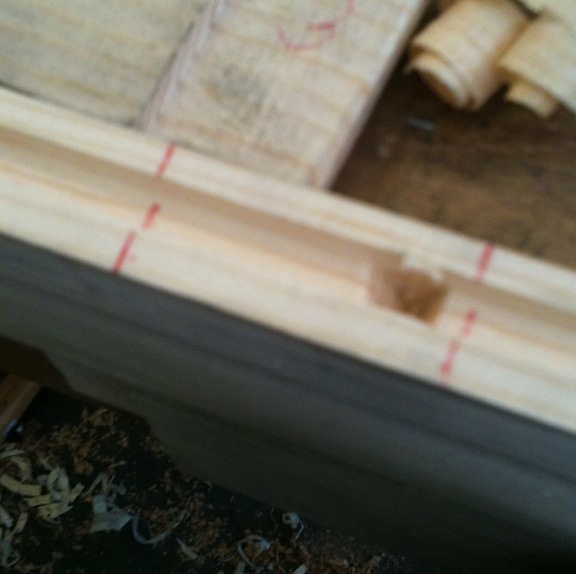 This 1/4″ x 2″ mortise 1 1/2″ deep took no time at all in white pine. I’m going to make some practice mortises in other kinds of wood for comparison. 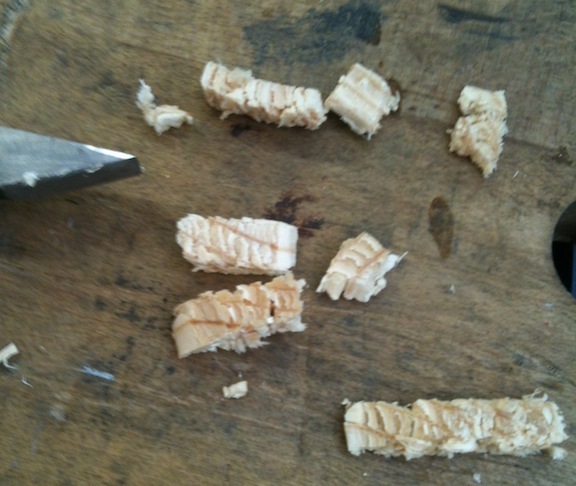 To do the final cleanup of the bottom and get the last of the chunks out I used a swan neck chisel. 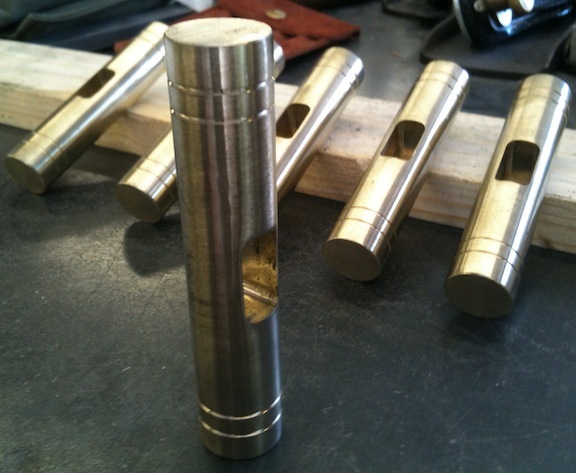 The finished mortise. 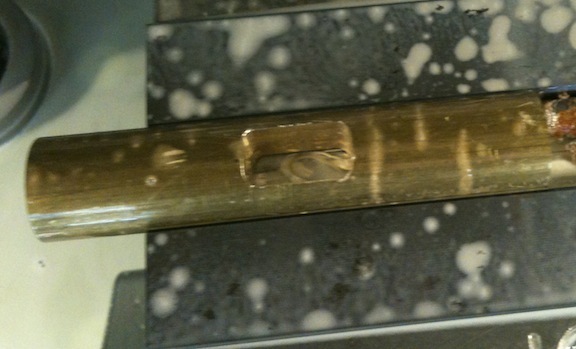 It’s not perfect, I bruised the side of the plowed groove prying a chip out, but I’m comfortable with the process now. I think I’m ready to have another run at the lid for my saw chest now. I also picked up some better quality pine, clear pine, at Southern Lumber. All clear pine is 20% off for the next week! True confessions: I’m a tool addict. I love tools. I could almost imagine being a tool collector, but that doesn’t quite ring true for me. I like using the tools and making things too much. But it’s that close. I like to make tools too. I made a few chisels and wooden planes years ago when I was doing power tool woodworking. I gave away most of the chisels as gifts, but I still have this one. 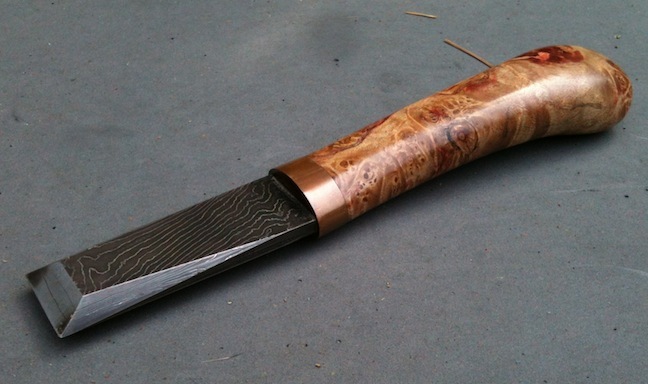 It’s O1 tool steel on the bottom, forge welded to a steel and nickel damascus billet. 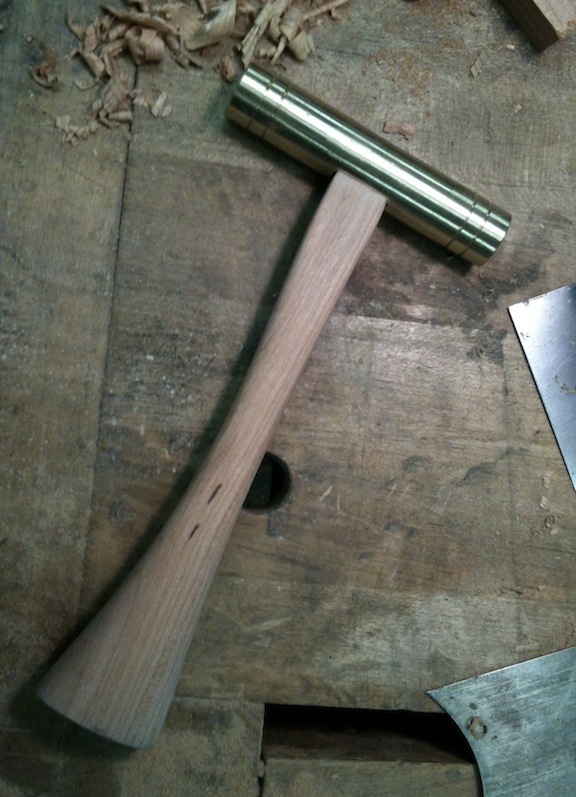 I shaped the handle to fit my hand, with the idea of using it to pare joints. Lately I’ve been thinking about making some metal bodied planes. 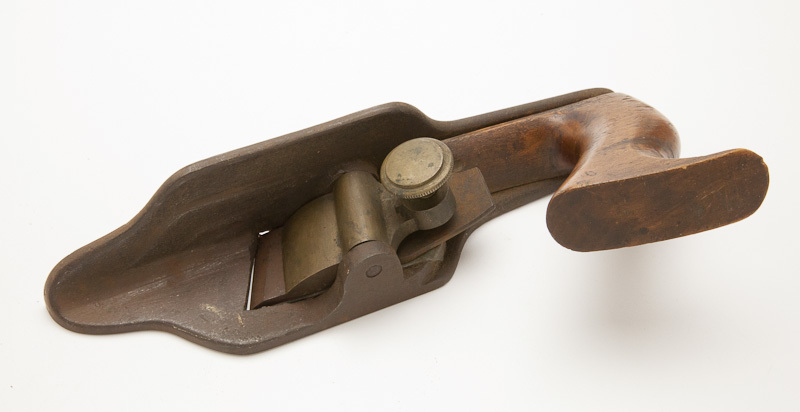 My first thought was a “Lancashire pattern shoulder plane” like this one. It’s an interesting design and I haven’t seen a lot of them around. 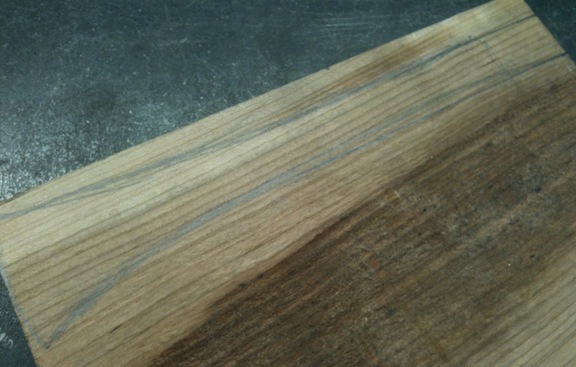 I’ve been collecting pictures of them, and there is a lot going for this design over a standard shoulder plane – like the skewed blade and the handle. But lately I’ve been leaning toward a miter plane. Since I had my CAD software fired up last night to program the toolpaths for the plane adjusting hammer I started doodling around with some ideas for a Scottish Mitre plane. I started with the basic geometry, 15″ long, 10 degree bed angle, bevel up, 25 degree primary bevel, 1/4″ thick by 2″ wide blade. The throat is 1/3 of the way back from the front. 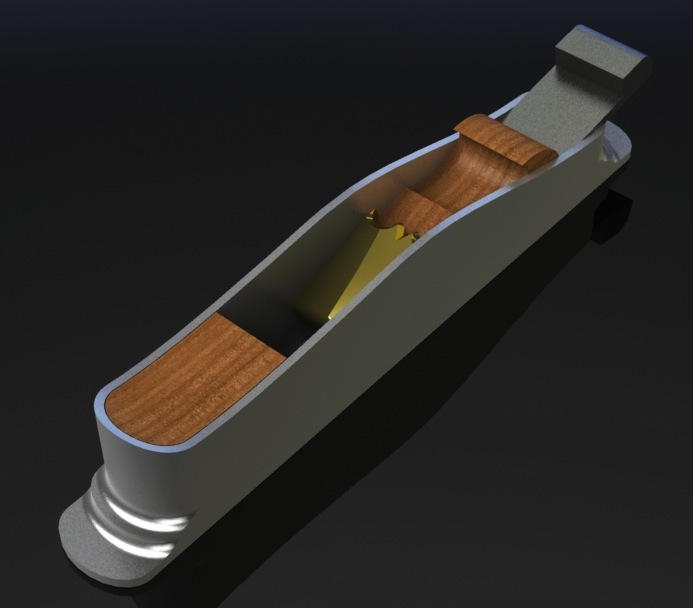 I mapped out the basic dimensions in SolidWorks and then just roughed in a design. I’m not totally happy with it, but it’s a starting point. I need to look at more images of traditional infill mitre planes, and just stare at this one for a while. I think it needs to be a bit wider, and I want to play with different shapes for the side profile. Some mitre planes are flat across the top, I think that would help with the alignment when shooting. Since I a low bed angle I need to have the back cut away for the blade to exit. But this is how design works for me – I get a first cut done, then make alternate versions and see what works visually.